Watch this on-demand webinar to learn how you can accelerate your AI initiative and deliver faster time-to-value with machine learning. AI has moved into the mainstream. Innovators in every industry are adopting machine learning for AI and digital transformation, with a wide range of different use cases. But these technologies are difficult to implement for large-scale distributed environments with enterprise requirements. Find out how to get up and running quickly with a multi-node sandbox environment for TensorFlow and other popular ML tools. Join this webinar to learn how you can accelerate innovation using AI / ML / DL in Healthcare and Life Sciences. Healthcare professionals and researchers have access to immense volumes of data from a variety of sources. Early adopters of Machine Learning (ML) and Deep Learning (DL) are uncovering new insights from this data to improve patient care and transform the industry with AI-driven innovations. But it can be challenging to deploy and manage these tools – including TensorFlow and many others – for data science teams in large-scale distributed environments. Don't miss this webinar. Register today! Join this webinar to learn how you can accelerate your deployment of TensorFlow and AI / ML in Financial Services. Keeping pace with new technologies for data science, machine learning, and deep learning can be overwhelming. And it can be challenging to deploy and manage these tools – including TensorFlow and many others – for data science teams in large-scale distributed environments. Join this webinar to learn about deploying H2O in large-scale distributed environments using containers. Artificial intelligence and machine learning are now a top priority for most enterprises. But it can be challenging to implement multi-node AI / ML environments for data science teams in large-scale enterprise deployments. Find out how to run AI / ML on containers while ensuring enterprise-grade security, performance, and scalability. Join this webinar to learn about KubeDirector – a new open source Kubernetes project for complex stateful applications. KubeDirector makes it easier to deploy data-intensive distributed applications for AI and analytics use cases – such as Hadoop, Spark, Kafka, TensorFlow, etc. – on Kubernetes. Now you can run stateful scale-out application clusters on Kubernetes. Find out how. 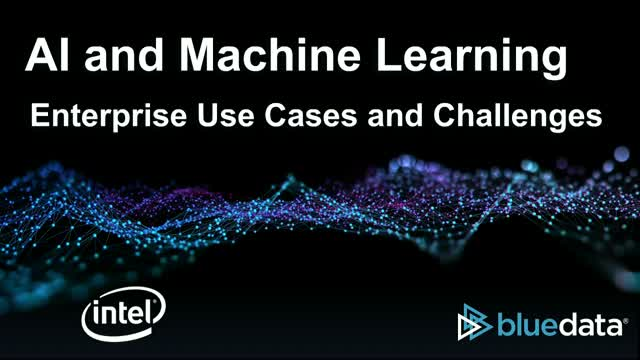 Watch this on-demand webinar for a case study with GM Financial on deploying Machine Learning and Deep Learning applications using a flexible container-based architecture. GM Financial, the wholly-owned captive finance subsidiary of General Motors, is a global enterprise in a highly regulated industry. Learn about their journey in implementing Machine Learning, Deep Learning, and Natural Language Processing – including how they’ve kept up with the blistering pace of change, while delivering immediate value and managing costs. Don’t miss this webinar! Gain insights from an enterprise case study, and get perspective on Kubernetes® and other game-changing technology developments. Watch this on-demand webinar to learn about using Kubernetes with stateful applications for AI and Big Data workloads. Kubernetes is now the de facto standard for container orchestration. And while it was originally designed for stateless applications and microservices, it's gaining ground in support for stateful applications as well. But distributed stateful applications – including analytics, data science, machine learning, and deep learning workloads – are still complex and challenging to deploy with Kubernetes. Learn about a new open source project focused on deploying and managing stateful applications with Kubernetes. Watch this on-demand webinar to learn about deploying deep learning applications with GPUs in a containerized multi-tenant environment. Keeping pace with new technologies for data science and machine learning can be overwhelming. There are a plethora of open source options, and it's a challenge to get these tools up and running easily and consistently in a large-scale distributed environment. Find out how you can spin up (and tear down) GPU-enabled TensorFlow and Spark clusters on-demand, with just a few mouse clicks. Watch this on-demand webinar to learn about use cases for Big-Data-as-a-Service (BDaaS) – to jumpstart your journey with Hadoop, Spark, and other Big Data tools. Enterprises in all industries are embracing digital transformation and data-driven insights for competitive advantage. But embarking on this Big Data journey is a complex undertaking and deployments tend to happen in fits and spurts. BDaaS can help simplify Big Data deployments and ensure faster time-to-value. -Sandbox: Provide data science teams with a sandbox for experimentation and prototyping, including on-demand clusters and easy access to existing data. -Staging: Accelerate Hadoop / Spark deployments, de-risk upgrades to new versions, and quickly set up testing and staging environments prior to rollout. -Multi-cluster: Run multiple clusters on shared infrastructure. Set quotas and resource guarantees, with logical separation and secure multi-tenancy. -Multi-cloud: Leverage the portability of Docker containers to deploy workloads on-premises, in the public cloud, or in hybrid and multi-cloud architectures. Watch this on-demand webinar to learn how separating compute from storage for Big Data delivers greater efficiency and cost savings. Historically, Big Data deployments dictated the co-location of compute and storage on the same physical server. Data locality (i.e. moving computation to the data) was one of the fundamental architectural concepts of Hadoop. But this assumption has changed – due to the evolution of modern infrastructure, new Big Data processing frameworks, and cloud computing. By decoupling compute from storage, you can improve agility and reduce costs for your Big Data deployment. Learn how the traditional Big Data architecture is changing, and what this means for your organization. Watch this on-demand webinar to see how BlueData's EPIC software platform makes it easier, faster, and more cost-effective to deploy Big Data infrastructure and applications. Find out how to provide self-service, elastic, and secure Big Data environments for your data science and analyst teams – either on-premises; on AWS, Azure, or GCP; or in a hybrid architecture. See an EPIC demo – including our latest innovations – and discover the flexibility and power of Big-Data-as-a-Service with BlueData. It's BDaaS! Panera Bread – with over 2,000 locations and 25 million customers in its loyalty program – relies on analytics to fine-tune its menu, operations, marketing, and more. Find out how they solve key business challenges using Hadoop and next generation Big Data technologies, including real-time data to analyze consumer behavior. Don’t miss watching this case study webinar. Discover your own recipe for success with Big Data analytics and data science! Watch this on-demand webinar to learn the key considerations and options for container orchestration with Big Data workloads. Container orchestration tools such as Kubernetes, Marathon, and Swarm were designed for a microservice architecture with a single, stateless service running in each container. But this design is not well suited for Big Data clusters constructed from a collection of interdependent, stateful services. So what are your options? Don’t miss watching this webinar on container orchestration for Hadoop, Spark, and other Big Data workloads. The BlueData EPIC software platform makes deployment of Big Data infrastructure and applications easier, faster, and more cost-effective – whether on-premises or on the public cloud. With BlueData EPIC on AWS, you can quickly and easily deploy your preferred Big Data applications, distributions and tools; leverage enterprise-class security and cost controls for multi-tenant deployments on the Amazon cloud; and tap into both Amazon S3 and on-premises storage for your Big Data analytics. The BlueData software platform is a game-changer for Big Data analytics. Watch this video to see how BlueData makes it easier, faster, and more cost-effective to deploy Big Data infrastructure and applications on-premises. With BlueData, you can spin up Hadoop or Spark clusters in minutes rather than months – at a fraction of the cost and with far fewer resources. Leveraging Docker containers and optimized to run on Intel architecture, BlueData’s software delivers agility and high performance for your Big Data analytics. Watch this on-demand webinar to learn how to deploy a scalable and elastic architecture for Big Data analytics. Hadoop and related technologies for Big Data analytics can deliver tremendous business value, and at a lower cost than traditional data management approaches. But early adopters have encountered challenges and learned lessons over the past few years. Discover the most common mistakes for Hadoop deployments – and learn how to deliver an elastic Big Data solution. Watch this on-demand webinar to learn how to get started with large-scale distributed data science. Do your data science teams want to use R with Spark to analyze large data sets? How do you provide the flexibility, scalability, and elasticity that they need – from prototyping to production? Find out how to deliver a scalable and elastic platform for data science with Spark and R.
Watch this on-demand webinar to learn how to deploy Hadoop, Spark, and other Big Data tools in a hybrid cloud architecture. More and more organizations are using AWS and other public clouds for Big Data analytics and data science. But most enterprises have a mix of Big Data workloads and use cases: some on-premises, some in the public cloud, or a combination of the two. How do you support the needs of your data science and analyst teams to meet this new reality? Don’t miss watching this webinar on how to provide on-demand, elastic, and secure environments for Big Data analytics – in a hybrid architecture. BlueData is transforming how enterprises deploy Big Data analytics and machine learning. BlueData’s Big-Data-as-a-Service software platform leverages Docker container technology to make it easier, faster, and more cost-effective for enterprises to innovate with Big Data and AI technologies -- either on-premises, in the public cloud, or in a hybrid architecture. With BlueData, our customers can spin up containerized environments within minutes, providing their data scientists with on-demand access to the applications, data, and infrastructure they need. Founded in 2012 by VMware veterans and headquartered in Santa Clara, California, BlueData is backed by investors including Amplify Partners, Atlantic Bridge, Dell Technologies Capital, Ignition Partners, and Intel Capital.